The Independent Booksellers Affiliate Programme (IBAP)is the umbrella of the initiatives Gardners provide for independent booksellers around the world. 2017 sees the 7th year of this popular scheme, which is supported by around 50 publisher members and provides initiatives such as www.hive.co.uk and our sponsorship of the Independent Bookseller of the Year Award, as well as proactive support for the BA Christmas catalogue and much more, as shown below. 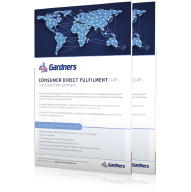 Gardners CDF (Home Delivery) services provide an efficient way to ship your customer orders worldwide; equipping you with a well-organised, cost-effective way to boost your online business, expand internationally and ultimately meet your customers delivery expectations. Gardners CDF services are available to all of our customers, via our Gardlink software, internet FTP and this website, giving you access to our extensive on-hand inventory, with orders picked, packed and despatched from stock on the day of receipt (for orders received before 3:00pm Monday - Friday). January 1st, April 1st, July 1st and October 1st. Your returns allowance is based on 5% of the retail value of books or dealer value for DVDs, of the amount you have spent with Gardners in the 3 months preceding one of the returns dates listed above. This figure is calculated across your stock, new title and Customer order purchases.